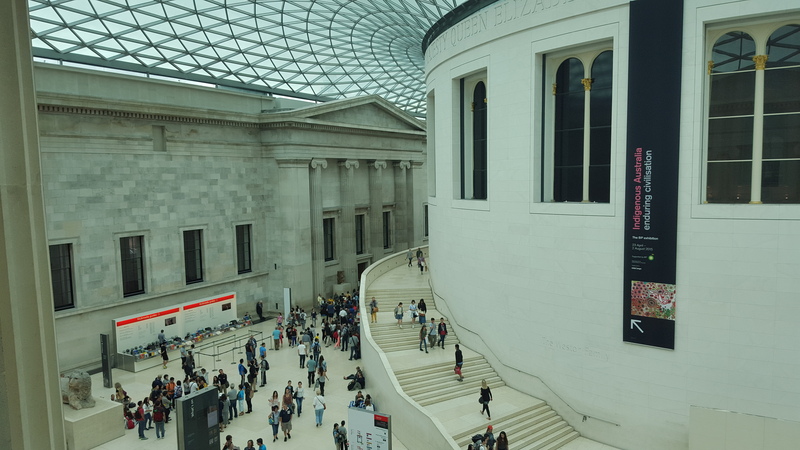 As far as historic surrounds go, you’d be hard-pressed to find anywhere more English than the British Museum – unless, of course, the Queen herself invited you round to Buckingham Palace for a tipple of tea and a National Anthem sing-a-long. 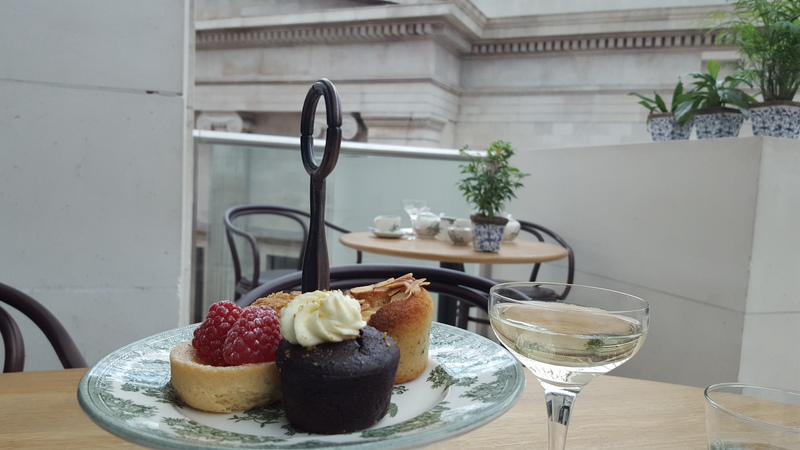 So, it’s with huge excitement (and a little bit of a swell in national pride) that I found myself standing in the British Museum’s inner courtyard, about to glide up the stairs to the top-floor Great Court Restaurant for a bout of afternoon tea. 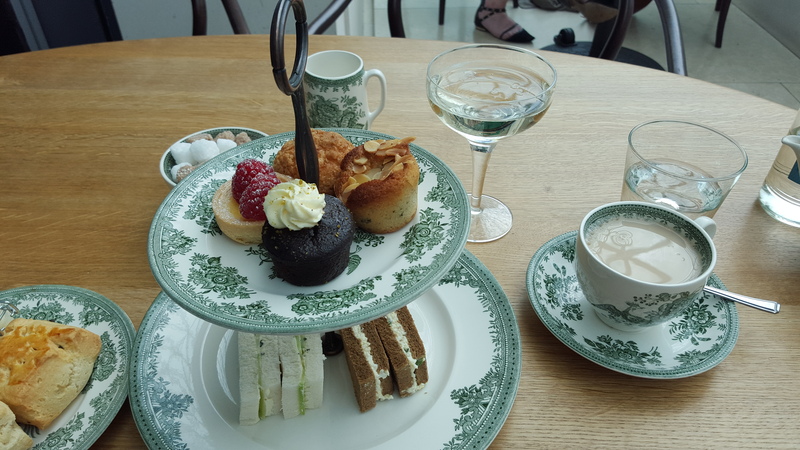 When I found out that afternoon tea was on the menu at the British Museum, I was – to begin with – a little bit annoyed at myself. For a whole year I lived just a short walk from the Museum in grotty university halls, and hadn’t once realised this iconic British location offered my favourite ‘meal’. This was why I was so determined to finally go along: to bring you my feedback and to ensure you don’t miss out when you’re next in the Capital! Oh, and to eat cake. I do like my cake. Sitting in my turquoise padded chair in the restaurant, I realised I hadn’t realised just how transparent the famous glass ceiling is. As I sipped on my glass of Prosecco, blue skies started to appear above me, while the faint murmur of tourists milling around in the forecourt seemed to fade away. 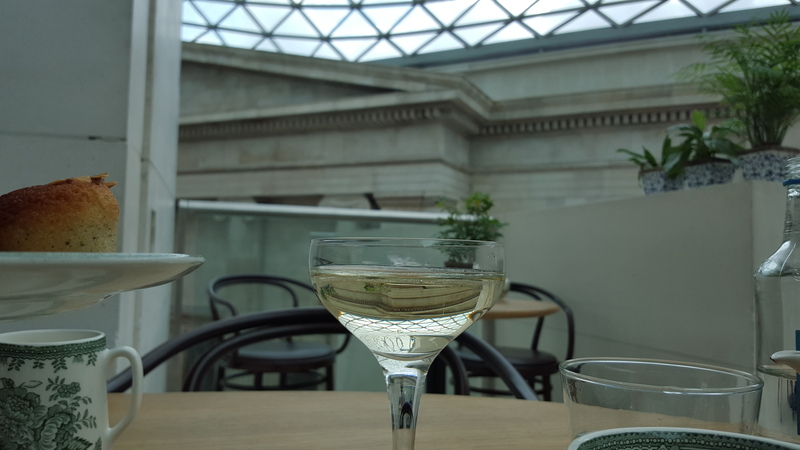 Situated at the top of the spiral staircase in the middle of the museum, the restaurant is an incredibly pleasant place to relax and catch up with friends. Served every day from 3pm, the afternoon tea is available in classic form, or with a glass of Prosecco for some added sparkle. My waiter for the afternoon was incredibly friendly, and was keen to accommodate my vegetarian tastes, bringing out double helpings of egg and cress, plus cream cheese, cucumber and mint sandwiches. The homemade cakes were just the right size for me to have alongside my two scones, served with generous dollops of jam and clotted cream. I loved the gorgeous matching china used for the spread – it definitely took the whole thing up to another level of class! While I did opt for a traditional English Breakfast Tea, you’ll be pleased to know the tea menu was full of other flavours. For the more adventurous, there are organic loose leaf teas of ginger and lemon, elderflower and lemon, garden berries and chamomile. Chinese flowering teas are also on-hand for something a little more exotic, but expect to pay a small surcharge for these. In terms of the taste factor and the surrounds, this afternoon tea at the Great Court Restaurant is hands-down the best traditional spread I’ve ever tasted. 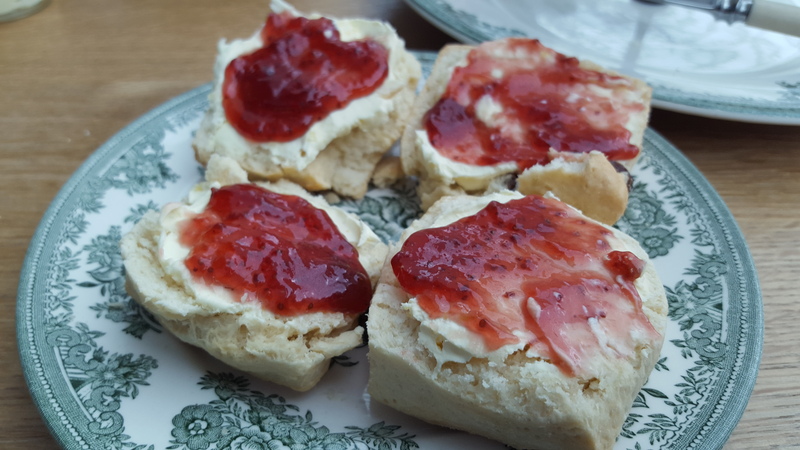 Plus, a day at the British Museum is never wasted – with so many exhibits to see, you’ll be glad to refuel mid-afternoon with these sweet and savoury delights. Many thanks to the Great Court Restaurant for inviting me along to try out their afternoon tea. All opinions, thoughts and photos are my own! Are you tempted by this delicious afternoon tea spread? I suspect an answer to your titular answer is no…!